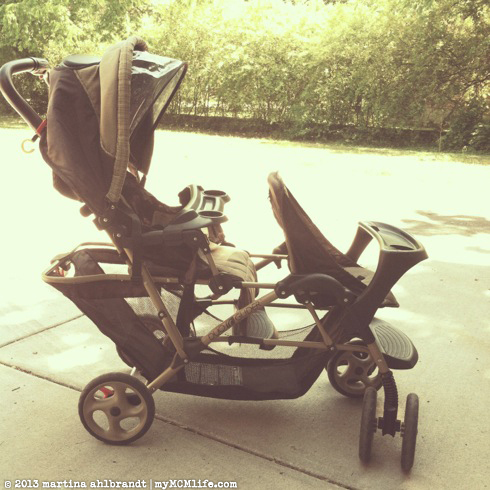 I was generously blessed with this amazing double stroller by a woman I had never met. She follows my Instagram feed (Hi @curlybirds!) and apparently reads here too. I am incredibly grateful that someone would take the time out of her day to drive across town to deliver a beautiful and certainly valuable double stroller to my house. Ali and I got to meet her and her six year old twin daughters, too. What lovely, lovely people! Last week a box arrived from a very thoughtful and generous blog reader, Jessica. She had contacted me a little bit ago (long enough for me to almost forget) asking if I’d be interested in receiving some hand-me-downs from her daughter who is a few years older than Precious. I gladly accepted. Many things were never worn since Jessica’s daughter has been in a purple-only phase for a while. I was surprised and so very blessed to see this box on Friday morning at my office. I couldn’t wait to go through everything. It’s mostly still too big for Precious right now (except for the cute kitty hat pictured below), which kind of makes me want her to hurry up and grow. But, really she is growing fast as it is and I know it’s not going to seem like very long from now when she’ll be wearing 2T and 3T. The least I could do is to give Jessica a big ole blog public, THANK YOU! She is also a very talented fine artist. Check out her website: JessicaFairley.com. I particularly love the seascapes.